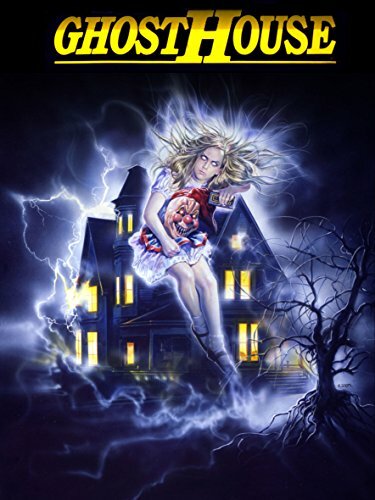 In the dying days of the Italian horror scene, Lenzi made this heavy-handed stew of haunted house clichés in America with U.S. actors and a slew of dialogue references to contemporary icons (Simon LeBon, Kim Basinger, Kelly Le Brock). Set to a persistent Goblin-soundalike electronic score, it opens well : in 1960’s Boston, birthday girl Henrietta (accompanied by an evil POLTERGEIST-style clown) kills her cat with scissors before her Dad cops an axe in the bonce and Mom receives a face full of glass courtesy of an exploding mirror (a signature Italian horror close-up lingers lovingly over a shard embedded in her eye). Two decades later, ham radio operators pick up anguished cries for help on their handset and in a kind of lo-tech variation on the set-up of ALIEN, trace the signal back to the creepy house. Not deterred by a bat nailed to the front porch and a head spinning in the washing machine, the couple stick around and befriend equally ill-fated ham radio users (!) within the house. Although never living up to its lively opening, there is much fun to be had from Lenzi’s appropriation of hoary old American horror tropes, from the token doomed comic-relief black guy to the creepy, meat cleaver-wielding, technophobe caretaker. Moments from other movies are thrown in at random (including an OMEN-ish devil dog) and the cops say dumb things like “Don’t you forget about the Salem witch trials – this is good old Massachusetts!”, but Lenzi stages a series of bravura gore set pieces that make up for the lack of atmosphere and a final reveal of what looks like a maggot ridden version of Skeletor from He-Man. Stand out death: a falling guillotine blade slices an annoying pubescent girl in half.